This is what a reluctant tango dancer looks like. President Barack Obama danced the tango during his visit to Buenos Aires on Wednesday—after declining "multiple" offers to dance, the Associated Press reports. Obama had been attending a state dinner with Argentinian President Mauricio Macri Wednesday night when a tango-dancing couple sashayed across the room. After showing off their own skills in upright gyration, the female dancer approached the president and offered to take his hand, as the male dancer requested a dance with the First Lady. Obama, though he seemed reluctant, obliged. What followed was an unforgettable lesson in spontaneity. Immediate reaction to Obama's moves were mixed. Some used the opportunity to lament that Obama will soon leave the White House, saying he and the First Lady "brought dignity and class to the role of First Family." Others, though, said it was ill-timed, given that the dance took place in the aftermath of deadly attacks in Brussels. Obama's two-day visit to Argentina is the first by a sitting president in two decades, and coincides with the 40th anniversary of the beginning of the nation's "Dirty War," a period of state-sanctioned terrorism against left-wing organizations. Obama has pledged to declassify U.S. military and intelligence documents in the hopes they will offer new information about the war. 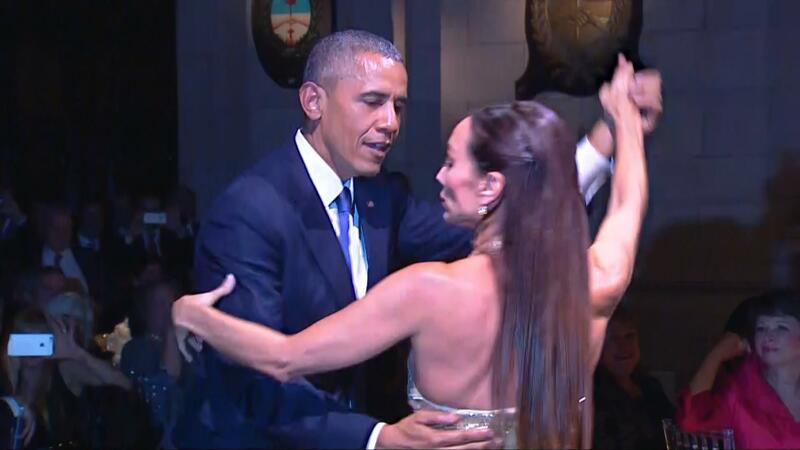 The post Watch President Obama Dance The Tango appeared first on Vocativ.